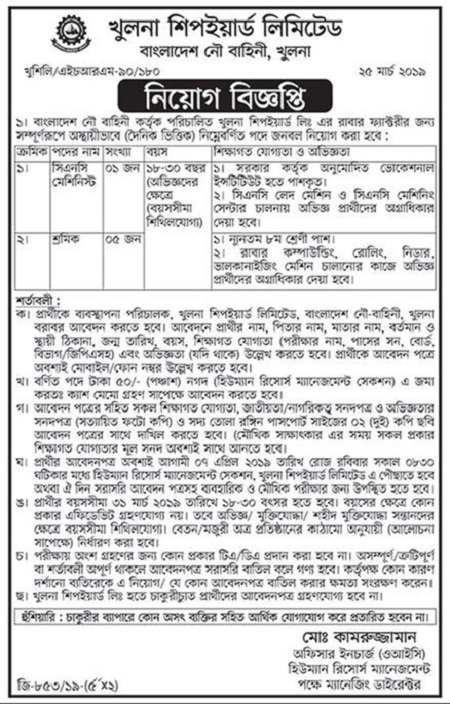 Khulna Shipyard Limited Job Circular 2019 has been published by their authority in daily online job portal and to get from the best jobs circular website in BD Jobs Careers- www.bdjobscareers.com. Well, we would like to inform you that, The Khulna Shipyard Limited is a ship construction and repair yard at the Khulna, Bangladesh owned by the Government of Bangladesh under Ministry of Defence and managed by the Bangladesh Navy. It constructs Padma-class offshore patrol vessels for the Bangladesh Navy. Two Durjoy-class LPC are under construction. It has built five Patrol Crafts for Bangladesh Navy and two container ships. Good news is, recently the organization looking various positions job holder for their organization empty vacancy. However, below you can all of details therefore you think you are the right candidate for this job then to submit your application by maintain their instruction. ■ Job Position: See Job Circular Image. ■ Job Source: online web portal. ■ Application Process: To See Below Job Circular Image. This entry was posted in All Jobs, Government Jobs, Janakantha Newspaper, Today Job by admin. Bookmark the permalink.